As the Kelvin color temperature goes up, light gets more blue. As we move away from incandescent light bulbs and toward energy-efficient options like fluorescent and LED, light temperature is getting a lot more attention. Not how hot or cold the bulb feels to your fingers, but how warm or cool it looks to your eyes. When people talk about colors, they often describe them as “warm” or “cool.” A “warm” white might be very slightly tinted with yellow, orange, or red. A “cool” white would have shades of green, blue, or purple mixed in. Photographers and artists think about this stuff all the time. You might not think about the difference between warm and cool colors — until you switch to a different type of light bulb. All of a sudden, everything looks … weird. Rooms that used to be comfortable and inviting now feel alien and disagreeable. The light is so unflattering! What happened? Your light bulb color temperature changed. Incandescent bulbs shine with a yellowish light that most people would call “warm.” The comfortable glow of an incandescent light bulb makes people feel relaxed and content. On the other hand, traditional fluorescent lights cast a blue-white light, a “cool” light, that some people find unpleasant. Very unpleasant. The New York Times and the BBC have reported that some homeowners and designers stock up on incandescent bulbs because they dislike the “sickly hue” of CFLs. Fluorescent and LED light is widely perceived as harsh, overly bright, and unflattering to skin tones. 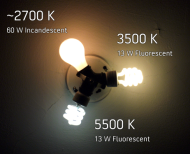 This is due to the color temperature difference between incandescent bulbs and many of the new bulbs. 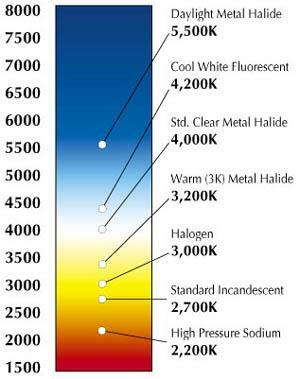 The Kelvin color temperature scale measures different colors of light. Here’s the technical breakdown. Light temperature can be measured and quantified in degrees Kelvin. The scale is counter-intuitive, however. Most of us associate red with heat and blue with coolness. That would suggest that reddish light would have a higher color temperature, and bluish light a lower one. When it comes to fire, though, blue is actually hotter than red. A relatively cool fire is red, a moderately hot fire is yellow, a very hot fire is “white-hot,” and the hottest flames are pale blue, like the flames on a gas stove. 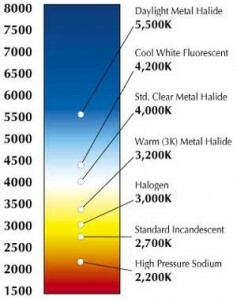 So the Kelvin scale is the opposite of what you’d expect: lower numbers describe red or yellow light, and high numbers describe white or blue light. Are CFLs Cooler than Incandescents? Incandescent bulbs clock in around 2700K, making them a soft yellow that most people enjoy. Traditional tubular fluorescent lights are higher, around 5000K, meaning they give off a white light with a blue tint. Early CFLs were like that, but as noted above, consumers complained. Now CFLs are available with color temperatures around 2700K, about the same as incandescent. They advertise this proudly on their packaging, in an attempt to entice consumers into making the switch. However, that doesn’t mean CFLs give off light that’s identical to incandescent bulbs. While the overall effect is similar, some colors may still look different under fluorescent light. The brainiacs over at Popular Mechanics explain that fluorescent light has a different spectral power distribution curve. Think back to science class and recall that white light is actually made up of all the colors of the rainbow. The SPD curve describes how the colors mix together. An incandescent bulb and a CFL might have the same color temperature, but their color mix is different. All of which is a very long way of saying that CFL technology has improved dramatically over the last few years, but some people may still prefer incandescent bulbs. Those who enjoy the warm yellow light and also want energy efficiency should check out the new class of halogen bulbs.